Second winter is as bad as the first one this year. 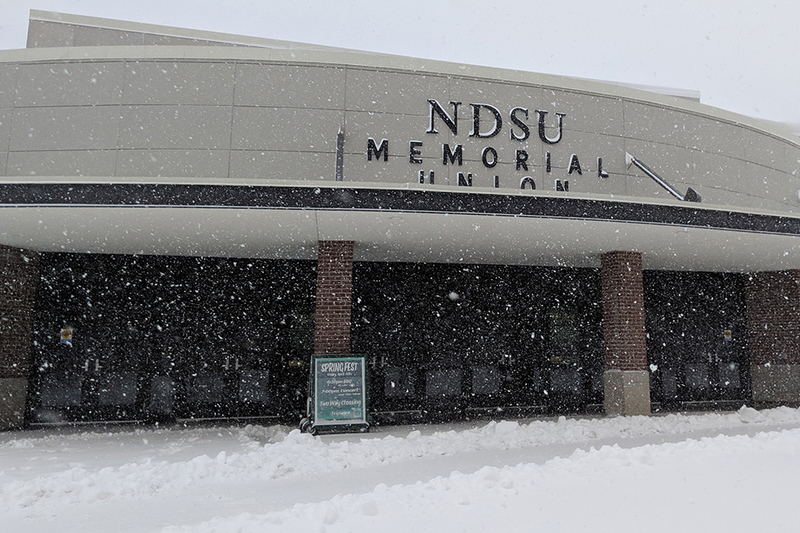 As the snow caused the city of Fargo to close April 11 and 12 and forced North Dakota State to close early April 11, NDSU students had something to say about this second winter. NDSU issued the closure of the university at 12:38 p.m. that Thursday, and shortly after sent out a notice that the public transit MATBUS services would also end early at 4:15 p.m. that same day. NDSU students had the following to say about the springtime snow. “The last time there was this much bulls— in the air it was election season,” said Bradley Foster, president of Students for Sensible Drug Policy at North Dakota State. “I just want it to be done snowing. I don’t want to have to break out the ice scraper when I go to my car. I just want to wear shorts,” Tyrel Iron Eyes, anthropology major, said. “I’m very sad and confused,” Lauren Algyer, political science major, said. “It was a bad year to buy white shoes,” Jamal Omar, microbiology major, said. “I think it’s pretty funny because of course this winter had to have one last big storm, just when we thought winter was over,” Cedar Remmen, theatre design and tech major, said. “Second winter is always expected. It’s like I never really get my hopes up at the first sign of spring. But this is way worse than what I expected. It’s pretty annoying,” Robert Watson, natural resources management major, said. “I feel very annoyed and frustrated about it. It also makes me worried about flooding, but I’m just really upset about it because I don’t want to have to scrape my windshields and worry about icy roads anymore. Like it’s April; this shouldn’t be happening,” Brandt Ronningen, elementary education major, said. “It’s really sad after have multiple 60 degree days in a row that we now go back to December weather, but don’t have the benefit of Christmas,” Anna Lundstrom, nursing major, said. “Sadly, I am tired of seeing the snow, and I wish it was summer already,” Abdi Sufi, business administration major, said.